When it comes to putting together specials, creativity is a big part of taking something ordinary and making it extraordinary. Chef Chris has put together an appetizer this week that is exactly that.....something simple turned amazing. His "inside out" fire roasted jalapeno peppers are a delicious blend of flavors. Although the weather this time of year will make you shiver, this appetizer is sure to warm you up. This is not your ordinary store bought, pre-made frozen stuffed poppers. 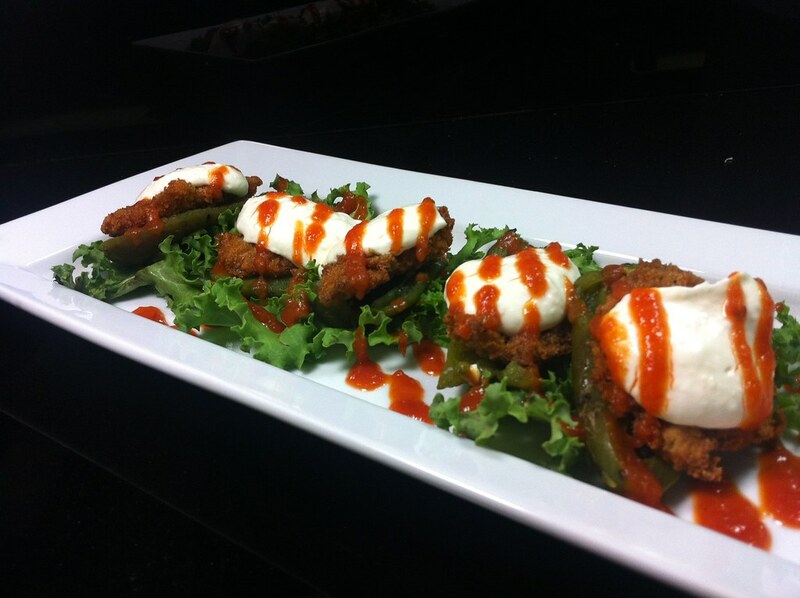 Our chefs take fresh jalapeno peppers and fire roast them over an open flame. They then top them with panko breaded and fried fresh oysters with a horseradish cream cheese. The oyster is the only part that is fried. You will get the roasted flavor from the fire, crunch from the oyster and the smooth horseradish cream cheese finish. As always, everything we do is made fresh from scratch, in house. Come down this week and experience these fire-roasted treats. You'd be surprised how often people ask us if we serve pizza. And 99.9% of the time we say, no. But every .1% of the time we get to say....kinda. In the next few days, we'll begin serving a filet flatbread appetizer that offers a special twist on classic pizza. We take a thin, crispy flatbread and spread a layer of blue cheese aioli as a sauce. Instead of typical mozzarella, we crumble fresh salemville blue cheese and replace the boring meat toppings of sausage and pepperoni with actual hand-cut pieces of filet mignon. Fresh shiitake mushrooms are mixed into the combination to help create a variation on supreme pizza. Our final topping - caramelized red onions - help balance the savory and creamy blue cheese with a touch of sweetness. There are many, many places in our area that boast great family style pizza, but why not splurge for something a little more eclectic? Plus you don't have to worry about it getting cold in the delivery driver's car on the way to your house. Face it, a night out is always better then getting a greasy pizza delivered. So take pizza night in a new direction and give ours a try.